As ice sheets and glaciers continue to melt, continents and land masses around the world are soaking up and storing more water. That’s temporarily slowing sea level rise, according to new research from NASA’s Jet Propulsion Laboratory (JPL) and the University of California, Irvine. Changes in weather and climate has led soils, lakes and underground aquifers to soak up and store an extra 3.2 trillion tons of water over the past decade – the equivalent of that contained in Lake Huron, slowing the rate of sea level rise by around 20 percent, NASA highlights in a press release. Published in the February 12 issue of Science, the groundbreaking research marks the first time scientists have been able to identify and quantify how storage of liquid water on land has affected the rate of sea level rise. That’s going to enable scientists to refine and improve their climate models and better inform policy making bodies, including the U.N. International Panel on Climate Change (IPCC). Scientists have always assumed that our growing reliance on groundwater for agricultural irrigation and consumption meant that greater amounts of water were flowing from land masses to the ocean than was falling on land as precipitation, lead author J.T. Reager of JPL pointed out. “What we didn’t realize until now is that over the past decade, changes in the global water cycle more than offset the losses that occurred from groundwater pumping, causing the land to act like a sponge – at least temporarily. 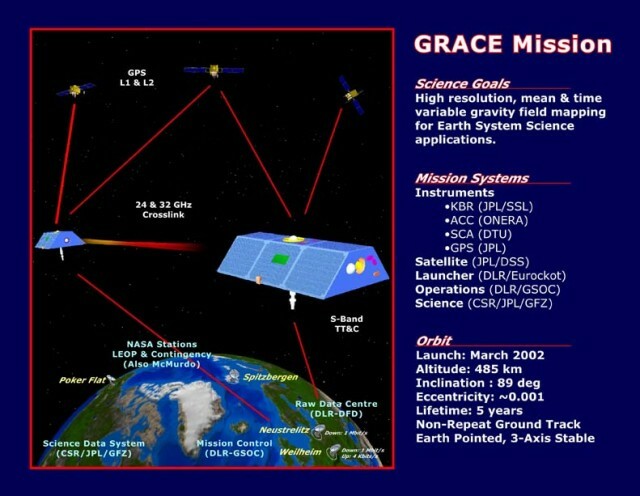 Data gleaned from NASA’s twin GRACE (Gravity Recovery and Climate Experiment) satellites enabled the scientists to carry out the groundbreaking study. Launched in 2002, the GRACE satellites detect changes in gravitational pull the world over, measuring them within the width of a human hair, according to NASA. Scientists are able to interpret and relate changes in gravitational pull to the amount of liquid water stored on land. With careful analysis the scientists were able to determine changes in ice sheets and glaciers, as well as the amount of water stored on land. That’s going to help scientists build better climate models and understand the impacts of a warming climate, both with regard to sea level rise and freshwater resources. “These results will lead to a refinement of global sea level budgets, such as those presented in the Intergovernmental Panel on Climate Change (IPCC) reports, which acknowledge the importance of climate-driven changes in hydrology, but have been unable to include any reliable estimate of their contribution to sea level changes,” JPL senior water scientist Jay Famiglietti, senior author of the paper and a professor at UC, Irvine, was quoted. Furthermore, GRACE data is enabling scientists to track changes in precipitation patterns over oceans and land, and reconcile the data with expectations that wet regions will become wetter and dry regions drier as the climate warms. In another new and groundbreaking study, two water researchers have created maps that measure global water resource availability on a monthly basis. More than 4 billion people live in areas of water scarcity – those where rates of water withdrawal are unsustainable, such as Washington State’s Klamath River Basin, according to the study, which has been published in the Feb. 12 edition of Nature.